Coach Cuonzo Martin is in his second season rebuilding the Mizzou basketball program. 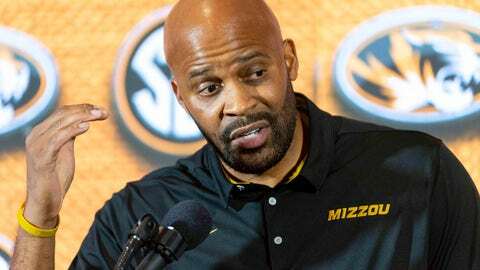 Missouri basketball coach Cuonzo Martin began construction of his 2019 recruiting class with the signing Wednesday of two highly rated recruits, forward Tray Jackson and guard Mario McKinney. Jackson, a 6-foot-8 power forward from Detroit, and McKinney, a potential two-way guard from St. Louis, signed National Letters of Intent with Mizzou. Jackson is ranked No. 56 in ESPN’s 2019 Top 100 list of prospects. He averaged 13.3 points and 5.0 rebounds for the Meanstreets on the Nike EYBL circuit. He was an Associated Press Michigan Class A all-state honorable mention pick after his senior campaign at Detroit Western International. After reclassifying to the 2019 class, Jackson is spending a prep school season at Sunrise Christian Academy in Wichita, Kan.
McKinney, who was tabbed the No. 1 player in Missouri’s class of 2019 by both ESPN and 247Sports, led Vashon High in St. Louis to back-to-back Missouri Class 4 state championships in 2016 and 2017 and was the Public High League’s player of the year in 2018. The four-star recruit is ranked No. 19 nationally among point guards and No. 125 overall. McKinney is the cousin of former Mizzou guard Jimmy McKinney, who scored 1,146 career points from 2002-06. He selected Mizzou over Louisville, Kansas State, Auburn, Oklahoma State, Iowa State and VCU.